BMW, Jaguar Land Rover, Opel and Seat (shown) are among automakers that have made connectivity a priority. The connected car sector is forecast to grow by more than 30% a year until 2020. Cars are rapidly being transformed into connectivity centers constantly linked to the outside world as automakers, suppliers and service providers try to benefit from a multi-billion-dollar sector forecast to grow at a double-digit rate for the rest of the decade. SNS Telecom Research, a consultancy that specializes in wireless infrastructure and mobile devices, estimates that connected car services will account for $14 billion in annual global revenue by the end of 2016. This will be driven by applications such as infotainment, fleet management, remote diagnostics and usage-based insurance. SNS also predicts that this sector will grow 31 percent a year between 2016 and 2020. This change is so significant that Robert Bosch CEO Volkmar Denner said recently: "The car as we know it will soon be history." He predicted: "Alongside the home and the office, the car will become the third living environment." Denner was speaking in November at an event run by Automotive News Europe sister publication Automobilwoche. 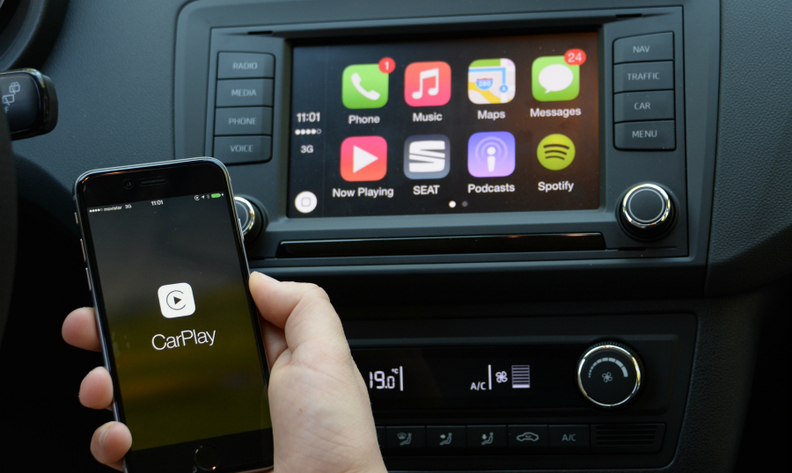 The vast majority of today's new cars have some level of connectivity. Most also offer some or all of the services associated with connected cars, including the transfer of smartphone apps and real-time traffic updates. The huge revenue-generating potential of these services has caused consolidation as players of all sizes look to add technical knowledge and fast track growth. In November, electronics giant Samsung agreed to buy connected car and premium audio systems producer Harman International to accelerate its push into the automotive sector. Chipmaker Intel has also made a number of acquisitions including Yogitech, a semiconductor functional safety specialist with expertise that can be applied to advanced driver assistance systems. The roll out of connected cars is gathering momentum with roughly 90 percent of BMW's new vehicles now fully connected. Jaguar Land Rover's target was 100 percent connectivity on models sold by the end of 2016. While this level of commitment might be expected from premium automakers, volume brands are also determined to capitalize on the trend. Seat CEO Luca de Meo has prioritized "affordable connectivity" and he wants all of the Volkswagen Group subsidiary's cars to be connected by next year. Most of the talk about connected cars is positive, but there are some unknowns around infrastructure, privacy and hacking. There is also a question mark over the roles that Apple and Google will play. Apple last month confirmed it is working on self-driving cars while Google has announced it will integrate its autonomous–driving technology into about 100 test vehicles based on the 2017 Chrysler Pacifica hybrid minivan. "The possible roles are clearer for Google than for Apple," Renault Group Connected Car Director Thierry Viadieu told Automotive News Europe. "Google wants into the car the same way it got into the smartphone – via the operating system. Their target is to have Android running the car. With Apple it is more complicated." As the car becomes more connected there is a genuine fear of hacking of both the vehicle itself and its data. Frost & Sullivan Mobility Senior Consultant Sriram Venkatraman said in a report that automakers will get help thwarting the hackers from "intense innovation by startups" that are "making available a plethora of reliable automotive security solutions." He said leading Tier 1 suppliers and cybersecurity companies such as Symantec and FireEye "have already started focusing on vehicle security due to a lack of end-to-end vehicle security services." Leyre Olavarria, Seat's global head of connected cars, is unequivocal about data privacy. "For Seat this is a very clear issue. Data belongs to our customers," she said. Opel takes a similar view. "We do not track any data, so there is no log file being transmitted," said the General Motors subsidiary's connected car manager, David Voss. At the infrastructure level, the biggest challenge for connected cars continues to be the availability of high-speed data networks. "For telematics you need 2G and above. For infotainment services, you need 3G and above," said Christoph Grote, senior VP of electronics at BMW. "5G also matters a lot to connected car. … In the past a lot of the connectivity was related to classical entertainment services. In the future a lot of the functionality will be more 'serious.' For example, automated driving will require the car to be entirely safe even without a mobile connection."